Today, the University of Western Australia (UWA) announced the winners of its two current competitions, MachinimUWA VI: Reflections and the UWA Centenary 3D Art Challenge (about which I wrote here), both of which by coincidence enjoyed 64 entries. These competitions award a total of L$1.7 million to the winners, and are truly international in scope, with entries from artists around the world. The leader of the UWA Virtual World Projects is Jayjay Zifanwe (or Jay Jay Jegathesan in real life), Manager of the UWA School of Physics; the competitions were curated by FreeWee Ling. Glyph Graves's winning entry, I Thought I Hated Him, may not look like much at first glace, but the concept is brilliant: "All movement and all music is generated by the intersection between the New York Stock Exchange (Mr New York) and the Shanghai Stock Exchange (Miss Shanghai) in real time when the exchanges are open," says the artist. You'll find more information at the installation. Curator FreeWee Ling has assembled a remarkable exhibition catalogue available here. Links to all the machinima entered in the competition are available here in 720p at AviewTV. Congratulations to all the winners. It was a privilege for me to serve on the juries of both these competitions. 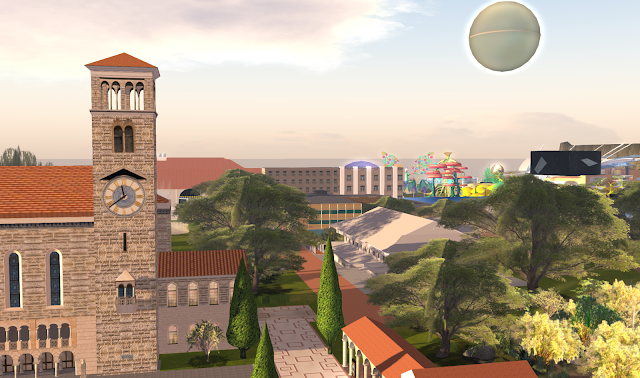 And thanks especially to the University of Western Australia for its pioneering work to encourage the development of art in virtual worlds.